Stompboxology tremolo. Anyone built it? Opinions on the schem? So, did anybody here ever tried it? And, schem experts, would you take a look and tell if it looks like a working schem? Re: Stompboxology tremolo. Anyone built it? Opinions on the schem? This could be an alternative to the R.G. 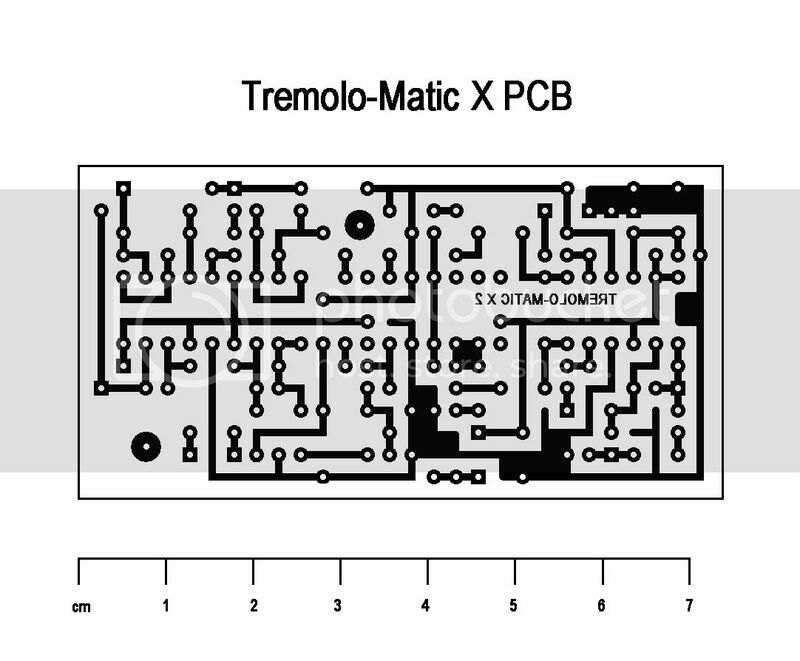 Vibrotremolo thing that he published in his webpage. That one has some volume problems for some builders (including me ) because it uses FETs, wich with all their inconsistencies make the builds "hit or miss", at least for the less experienced people. I have not built this one but i have built quite a few Boscorelli (Stompboxology and the Stompbox Cookbook) designs and they are a very, very well designed. Based on my experance with the the ones i have built, this will be a very stable and quiet. I did not see any Out of Production chips in the schematic, which has been the one major problem i have had with these designs. In particular the SSM2120 was used in a few of the projects. Not to dredge up old topics but i remember some speculation a few years ago that he may be an insider with a commercial effects maker and that is the reason that he disappeared from the scene without a trace. His book is still my most holy possession i own. I'm sure it would work. 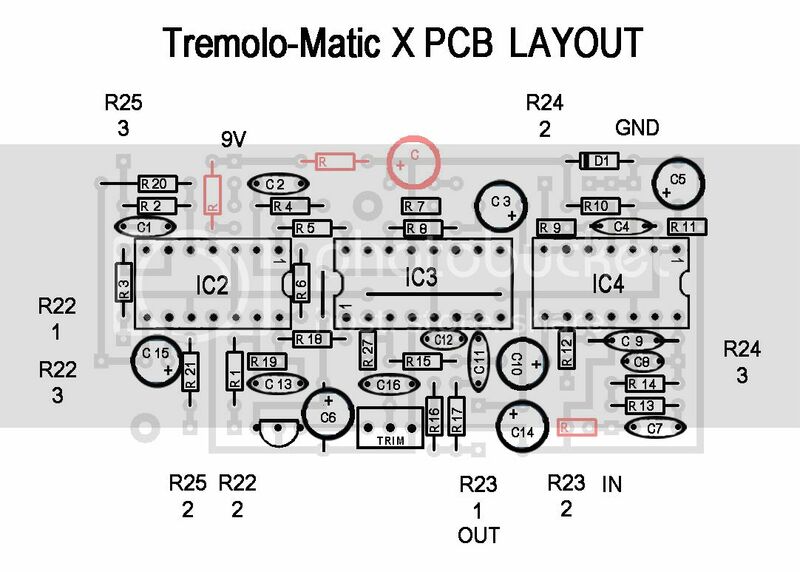 I doubt that Boscorelli was a commercial stompbox designer - because, all his circuits have TOO MANY components to be commercially viable (hint: it isn't the parts that cost money, it's the soldering them in). Thanks boys for the answers. Of course, I´m already making a PCB/perf layout for this... couldn´t sit still. The originally published layout is a real mess of flying wires and jumpers, and way too big. Right on, I wanted to build this, but I have yet to find the time. You are inspiring me. Sounds like it applies tremolo to bass and treble separately? That's possible. But he could have been writing to the DIY commuinity . In commercial appications his circuits could be soldered with a wave machine. These machines are generaly not availible to hobyists. This also possible that he wasn't. It's interesting to hear these circuits described this way, as I always find Bosco's theory of operation to be really over my head and I'm never sure what the projects are supposed to sound like. I've had the book since it first came out, and I've yet to build anything from it. But back on the topic of tremolo, it's interesting to hear this sort of vibrato as involving flipping frequency ranges out of phase to get that warbly Magnatone vibrato. I've been using these sort of techniques to get unique modulation effects with plug-ins in the studio. I will do things like duplicate a track, insert a tremolo and an EQ, invert the phase and EQ it like a bandpass filter to just tremolo a certain frequency range. From there, I'll try all sorts of experiments with syncing tremolos and EQing them separately, spreading them in stereo...putting the un-tremoloed track in mono, and spreading the inverted tremoloed track in stereo with a super-short delay, etc. Those sort of experiments are so much fun and so easy to do within a DAW recording system, as long as you're thinking creatively. Now the thought of putting that sort of effect into a stompbox just makes me want to unplug the soldering iron and go play chess or something, because I feel like I would go crazy putting a circuit together with so many "modules"...."It will never work!" I say to myself. I just remembered what sparked my interest in tremolo effects with inverted phase. The first time I jumped channels on a Vox AC30 and realized that the Brilliant channel and the Vibrato channel are out of phase with each other, I had a field day with messing with the tremolo and adjusting the volume of the two channels to get a cool warbly vibrato. I thought I had discovered something! Rodgre, what you can do in a DAW is way beyond stompbox territory, yes, but you don´t get to smell solder fumes! I think this thing is not that complicated, at least in theory. UNVERIFIED. Just finished it. What do you think people? Any mistakes? Some comments: I added a pulldown R in red, not sure if it´s neccesary. I modified the polarity protection diode to a different configuration, the one in the schem loses 0.6V and I don´t want to reduce headroom. The article mentions a technique to reduce LFO ticking in the circuit, but maybe it would be a good idea to add decoupling to the (audio) IC´s power (100R + cap)? Boscorelli's designs are clearly descended from the analog synthesizer school of design, not stompboxes. There are a few traditional design points for guitar pedals that Boscorelli simply ignores too often for him to have been mostly a stompbox designer. The use of dual, non-9V power supplies, the complexity of the circuits, and the nominal design correctness of the circuits all say that, as well as the fact that the control ranges are not limited to things that are useful. Guitarists are NOT the same mentally as synth players. I believe he had experience with synths and did a simple, first-order transdesign for guitars, missing many of the important things to make the circuits useful as real, on-stage guitar pedals. The cookbook just aren't stage-ready stompboxes. In fact, IMHO "Stompbox Cookbook" is a misnomer. It leads you to thinking that the book will tell you - metaphorically - how to make better burgers, or quick dinners for the family from ingredients found in every pantry. A better analogy would be something like "Preparation of Formal, Complicated French Cuisine in the Classical Style, with Rare Ingredients and Special Techniques". I've spent a long time looking at synth circuits as well as guitar circuits. Even designed a few for myself, and adapted a few for guitar. 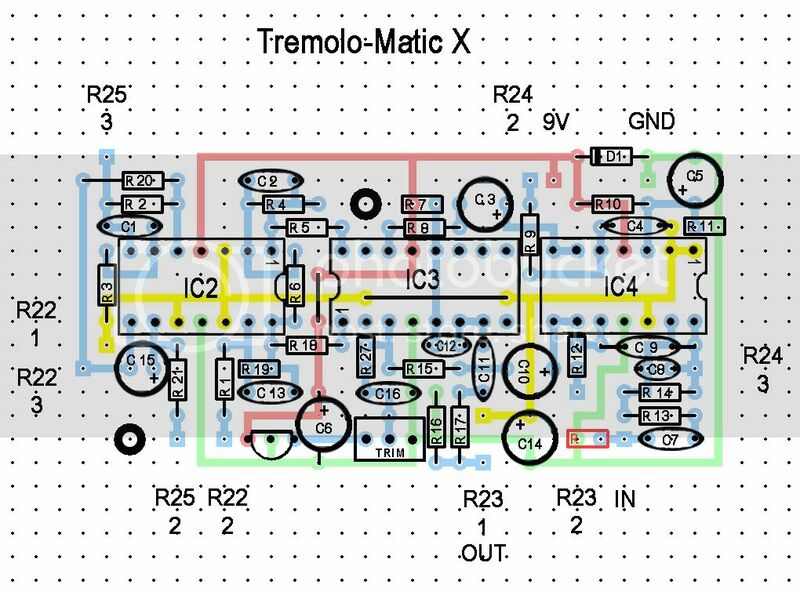 There is much to admire from the technical side in synth circuitry, because you can get things done that are not practical in guitar stompboxes. That's precisely because the normal restraints of power supply, complexity, small size, and parts cost are removed. You can do things that are otherwise not practical. But making real stompboxes out of synth circuits is hard, because you have to re-impose the limitations of the stompbox format on them. Even Anderton missed this one. How much more popular would the circuits from EPFM have been if he'd not used dual supplies for a lot of them? Quick IQ Test: If anyone in a governmental position suspected that YOU had top-secret information on YOUR computer, how many minutes would you remain outside a jail cell? I've been waiting to reply to this thread until I finished building it and now I have. First, I can confirm that the layout posted works. I, stupidly, forgot to put the jumper under IC3 before I installed the socket so I had to use a bit of insulated wire on the back of the board instead, but that's a minor issue. After a short de-bugging (one trace routed wrong and one cold solder joint) it fired right up. It sounds great. Nice sounding tremolo with the highpass and lowpass corner pots in the mid position and wonderful, almost phase shifter, sounds with those two controls turned down. I wouldn't mind just a bit more speed than is available (I might try reducing R21 to 4k7 or so) and a bit more depth (not sure what to do about that) but it's really pretty good as it is. I replaced R14 with a 470k resistor and a 1M pot to give control over the gain as noted in the Boscorelli article. Since some of the cooler sounds are when the highpass and lowpass are turned down and as this results in noticably lower output this mod, or the other one I did, is really required. The second mod was to replace R16 and R17 with a 10k pot to have a volume control. Stock, the two resistors work as a 13k volume control turned about a quarter of the way up. Turned all the way up there is quite a volume boost so I suppose with the depth turned all the way down this could be used as a functional boost pedal. Note that even with the 'gain' turned all the way up I don't get any clipping (using a cheap Les Paul copy). Thanks for the layout, it's much better than what Boscorelli provides. I don't suppose you're planning on making layouts for any of the other projects in the series ? Maybe I´ll make some others, but not soon. If I do I´ll certainly post them. About the depth issue, maybe fiddling with R1 + R22 total value? if more resistance--> more depth--> increase value, if less resistance-->more depth--> decrease value. How about the pulldown R? did you use it? Have you tried using a bypass switch, to see if it pops when bypassed/engaged? How about the input Z? does it lose highs when engaged or not? Although that might be hard to hear since this thing modulates the highs...so maybe it doesn´t matter if it does. With the mods you made, it´s easy to get unity gain w/ the vol pot when in use, regardless of the hi/lopass corner pots settings? Too many questions? I´m excited. Man, I have to build this... so many schems, so little time...grrr. Would asking for a soundclip be too much to ask? Here´s a PCB layout. I added power supply decoupling because I wasn´t sure if it ticked or not, the red R and cap (100R in series with a ¿100?¿1000? uF cap to ground), but otherwise the same as the previous one. If not needed just replace the R´s with a jumper and leave out the caps. BTW, one of the caps is not pictured and both have their negative side connected to ground with a wire, sorry. Oh, another question, What does the trimmer do? I believe it´s some kind of control to minimize feedtrough (what the hell is that) for the 570/71 chip. Hmmm... yeah, sure, as if I know what that means. Anyone more informed than me care to explain? I'm not getting any ticking, or at least not enough that I particularly noticed it when I tested it. Most of my testing was done through a cheap battery powered practice amp that I use when I build stuff in hotel rooms as I did with this. I also gave it a quick test through a small Jazz Chorus amp (JC 66?) and if there was any ticking it wasn't loud enough to draw my attention. I used a 1M pulldown resistor at the input, true bypass with a dpdt stomp switch. I didn't notice any popping when engaging it but I wasn't listening for popping either so there might be some happening. Again, if it's there it's not loud enough to stand out. I didn't notice any loss of highs, but as you say it might be the nature of the effect. In any case, it didn't sound muddy or muffled. With the volume pot mod I can get more than unity gain even with both corner pots turned all the way down. Combined with the gain pot mod this thing will boost the signal quite a bit if you want it to. I usually like just a bit of boost when I engage modulation effects so it's nice to have. I forgot to mention that I didn't do the feedthrough mod. I built this in a hotel room (I travel quite a bit as part of my job and building effects is more productive than watching TV at night) and forgot to bring the parts for the mod (I used the Boscorelli parts list and it doesn't include the parts for the mod). In the article he mentions that it's probably not necessary and I haven't noticed any unusually whining or ticking so I guess I didn't need it. Build it without first and add it if you think you need it. Unfortunately I don't have any way to make a sound clip (I'm a bit backwards when it comes to using a computer). Build it for sure. I 'm usually a bit neutral on the sound of effects but I particularly like this one. For some reason I`m reminded of Jurassic Park. Cloning dinosaurs from DNA found in a primeval gnat, or, whatever it was. The Stompbox cookbook is such a holy grail yet many people have said that the designs are impractical. Good job on giving one a go. All that remains is to make the obligatory soundclip request. I found if I changed R14 to 309K this decreased the gain on the input. This cleared up most of the distortion that I was getting. To make up the loss of gain I removed R16. This increased the gain enough so the effect trems a little more than unity. It's sounding very good now. I may have to build another! Soggy, cool, you got it working. I made this a while ago, sounded really nice, but it had too much hiss for me, tried to eliinate it but I couldn´t, so I just forgot about it. Recently I found a companding circuit with a 570 chip, and that reduced noise to workable levels, so I´m actually going to box it. The noise I was having trouble with was not so much a hiss, it was more of a short harsh distortion that would appear when you hit the strings hard, especially when you were playing with hot pickups. Very un-musical.